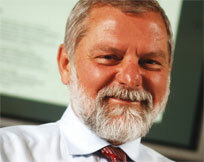 Vuk Hamović is one of the founders of EFT and he acts as executive Chairman of the Group. Vuk was born in Belgrade in 1949. His father served with distinction as the Yugoslav Army Chief of Staff and successive postings around the former Yugoslavia introduced the young Hamović to life in all the Republics. Between 1968 and 1972, Vuk attended the University of Belgrade where he studied Economics. His postgraduate studies saw him specialise in probability models and he emerged with a Masters' Degree in 1974. He immediately joined Energoprojekt and over the next 10 years moved up through the company to become President of Energodata, the company's IT arm. Vuk's stewardship of Energodata saw the company's most productive period with the successful development of Yugoslavia's first PC system, TIM 011. His time in the Energoprojekt Group also saw him travel to many parts of the world, developing an expertise in the structuring and financing of complex financial transactions. Vuk's departure from the state sector coincided with the opening up of the Yugoslav economy to private enterprise. In 1987 he established a private financial engineering company, Milnah, in which he was a founding shareholder. Experience gained at Energoprojekt in recovering problematic international debts proved invaluable as Milnah structured profitable transactions that solved external debt problems for companies and countries alike, across the globe. After two successful years at Milnah, Vuk left to co-found East Point Holdings (www.point-group.com). The period between 1989-1992 saw Vuk enjoy major success in trading on international secondary debts and clearing account markets, through the settlement of various debts of countries of the former Soviet bloc in transactions on the western European financial markets. This period also saw the beginning of Vuk's active engagement against the ruling Miloševic regime in Serbia, during which he co-founded the 'Vreme' weekly magazine in Serbia, and financially supported the opposition Democratic Party. After the failed bid for the Yugoslav Presidency by Milan Panić in 1992, which he financially backed, Vuk's supportive role of the Serbian opposition put him on a conflicting course with the new ruling elite in Serbia and he decided to leave Belgrade for London. During the same year he sold his stake in East Point to his partner. In London, Vuk started working for GML International, an investment banking firm regulated by the UK Financial Services Authority, advising Central and Eastern European governments on their debt. As both a shareholder and Director, he worked under the GML umbrella throughout the 1990s on numerous debt transactions across a wide range of Eastern and Central European countries. During the second half of 1990's, Vuk engineered several debt transactions related to the energy sector. From these the idea was developed to form EFT together with associates in the finance and energy worlds. The company was formed in 2000.